Make the eggs: Preheat the oven to 375F. Grease a 8×11 inch glass baking dish well with non-stick cooking spray or coconut oil. Whisk eggs, milk, and seasonings (I do 1/4 tsp each salt, pepper and garlic powder) in a bowl and then pour into the baking dish. Cook for 20-25 minutes, until eggs are fully cooked and the center is no longer jiggly. Cut into 6 equal slices, and set aside to cool. Make the bacon: While the eggs are cooking, make the bacon on the stovetop (or your preferred method). Heat a deep skillet or Dutch oven over medium heat. When hot, add strips of bacon. Using tongs, flip after a couple minutes, let them cook through to your desired crispness, and then place on a plate lined with paper towels. Repeat with remaining bacon. TIP: After cooking, fold the bacon into a V shape on the paper towels while hot and pliable (see photo above). The bacon will cool and slightly harden in this shape, and fit perfectly onto your sandwich. Set aside to cool. Toast the muffins (optional): Lay the English muffin halves out on a half size baking sheet, cut side facing up. Brush each with melted butter. Place into the 375F oven for 5-7 minutes or until the edges are crispy and golden brown. If toasting at the same time as cooking the eggs, put the eggs on the bottom rack and the muffins on the top rack. Watch closely so they don’t burn. This step is preferred when eating the muffins right after cooking, but not required if going straight into the freezer. 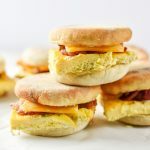 Assemble and store: Once all the parts are cooked and cooled, assemble your breakfast sandwiches. Each with a slice of egg, one piece of bacon, and a slice of cheese. Wrap each sandwich in parchment paper. If freezing, store all sandwiches in a gallon Ziploc bag and store sealed in the freezer, enjoy within 1-2 months. If refrigerating, use an airtight container and enjoy within 4 days. Reheating: From the refrigerator, reheat in the microwave on High in 30 second increments for about 1 minute until heated through. From the freezer, reheat in the microwave on Medium-High power (I do level 7) in 30 second increments for about 2 minutes, flipping halfway through. If you prefer a crispy muffin, separate the muffin from the frozen sandwich insides and reheat the muffin separately in a toaster. After reheating a couple of these sandwiches, you’ll figure out your preferred method easily. Inspired by Breakfast Sandwich Meal Prep from Tasty. Nutrition information estimated with My Fitness Pal.